Christmas is around the corner, so don’t wait any further! 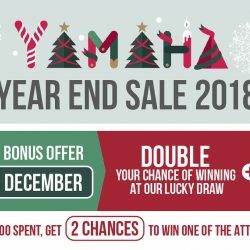 Get ready for Yamaha’s Xmas Bonus Offer, starting from 7-16 Dec 2018, 10 Days only! Double your chance of winning at their lucky draw plus enjoy special discounts and giveaways! Yamaha Piano Fair 2018 is back! Bring your family and friends down for FUNtastic Piano Days happening on 1 & 2 Sep @ Suntec Convention Centre Hall 300-304! 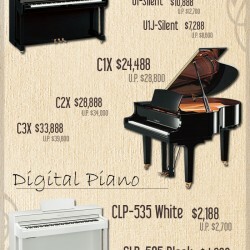 Select your favourite piano from more than 30 different models! Don't miss Yamaha's biggest piano event! Yamaha Mid-Year Sale is back! Great Savings on musical instruments like pianos, keyboards, guitars and more awaits you from now till 31 July 2018. 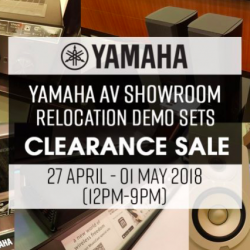 Yamaha's AV Showroom is moving and they are having a Clearance Sale from 27 April to 1 May for display sets to make way for brand new units for the new showroom! All the display sets are current models, they are all in good aesthetic and working conditions, and the full 1-year warranty will still apply from the day of purchase/collection. Please drop by and pick up the Yamaha AV Products that you have been long-eyeing at huge discounted prices! All products will be sold on a first-come-first-serve basis, while stocks last! Based on past experience, Yamaha recommends interested consumers to come early to avoid any disappointments! 9 - 11 Mar 2018 Yamaha: Massive Clearance Sale with Up to 90% OFF Guitars, Drums, Pianos, Books, Accessories & Many More! Yamaha massive clearance sale is back! Mark your calendar this coming 9 - 11 March and enjoy up to 90% off on a wide variety of musical instruments and accessories including guitars, drums, amplifiers, synthesizers, brass, winds, strings, pianos, digital pianos, portable keyboards, AV, books, accessories and more. See you there! 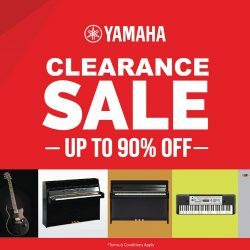 Yamaha is having a Display Set Clearance Sale! 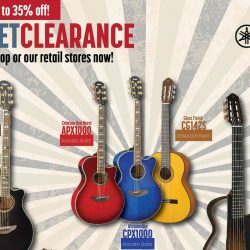 Up to 35% off ranging from acoustic guitars, classical guitars and silent guitars. Also dun miss their Flash Sale on guitars, drums & stage pianos! Visit Yamaha e-shop or Yamaha retail stores for more information. Available now till 31st July! Don't miss it! 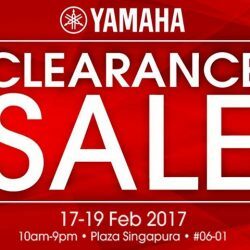 17 - 19 Feb 2017 Yamaha: Clearance Sale Up to 80% OFF on Musical Instruments, Books, Accessories & More! 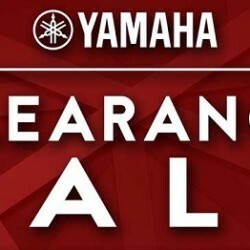 Yamaha Clearance Sale! Enjoy up to 80% OFF on Guitars, Drums, Amplifiers, Synthesizers, Brass, Winds, Strings, Pianos, Portable Keyboards, Pro Audio, Books, Accessories & More from 17 to 19 February 2017! Yamaha Ultimate 50th Anniversary Year End Sale 2016 is now on! Exciting promotions on musical instruments have started now! Also get FREE FairPrice vouchers up to $100 with purchase! Valid till 1 January 2017. 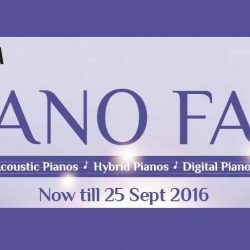 The much-awaited Yamaha Piano Fair has started! We are having a special two-day in-store roadshow specials this coming weekend (3-4 Sep) with plenty of activities and free giveaways worth up to $1800! From now until 25 of Sept, enjoy BIG discounts and freebies for Piano, Digital Pianos and Books when you visit any Yamaha retail outlets & authorized dealer. 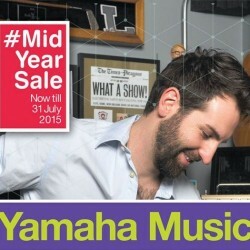 It's that time of the year again for the much anticipated Yamaha Music MID-YEAR SALE! From now until the 31st of July, enjoy 12%-15% STOREWIDE DISCOUNT when you visit any Yamaha retail outlets, authorized dealer or shop online at the Yamaha e-shop! They are also giving away a commemorative EZ-Link Cards with $50 cash value each*. 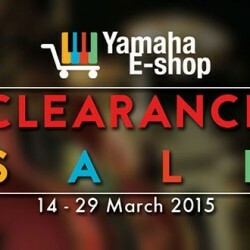 It's that time of the year again for the most anticipated Yamaha Clearance Sale! Enjoy up to 70% discount on selected musical instruments including guitars, amplifiers, drums, saxophones, trumpets, portable keyboards, and Pro Audio products, as well as accessories and more! The sale is on from the 19th to the 21st of February 2016 at Yamaha Plaza Singapura (6th floor), from 10AM to 9PM. Selected models are also available on sale at Yamaha Tampines Mall (#04-K1), Thomson Plaza (#03-24), and Westgate (#04-40). Hurry, only limited quantities available! 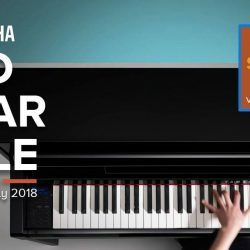 Yamaha Music have started their Mid-Year Sale and in conjunction with SG50 celebration offering discounts as much as 35% on 50 bestsellers in their stores islandwide. Valid till 31 July 2015. So, come and hurry! 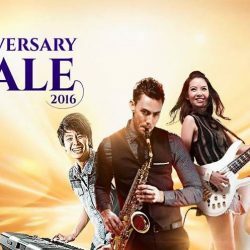 Enjoy Yamaha Music celebrates Singapore’s 50th birthday with BIG discounts on Singapore’s 50 favourite instruments! Now until 30th of June, purchase your favourite keyboards, combo products, band & orchestra, as well as professional audio products at up to 35% off! 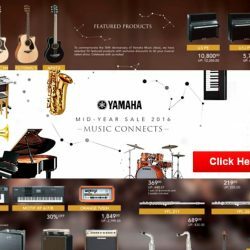 If you missed the earlier Yamaha clearance sale at their flagship store in Plaza Singapura last month, here’s another chance to find your new music instruments and accessories at a discount except Yamaha Singapore is taking it online this time round so you won’t have to worry about queues and waiting. For a limited time this month from now till 27 March, Yamaha Music Singapore is offering more than 15% discounts on selected Yamaha keyboards. Good news if you are looking for a brand new keyboard or replacement. 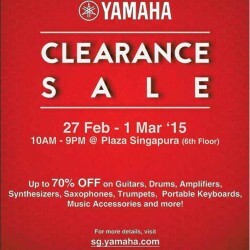 Yamaha offers Clearance Sale up to 70% off on Guitars, Drums, Amplifiers, Synthesizers, Saxophones, Trumpets, Portable Keyboards, Music Accessories and more this 27 February to 1 March 2015.